This powerful painting is an outstanding example of the artist's work, as well as an enduring image of monarchy restored. 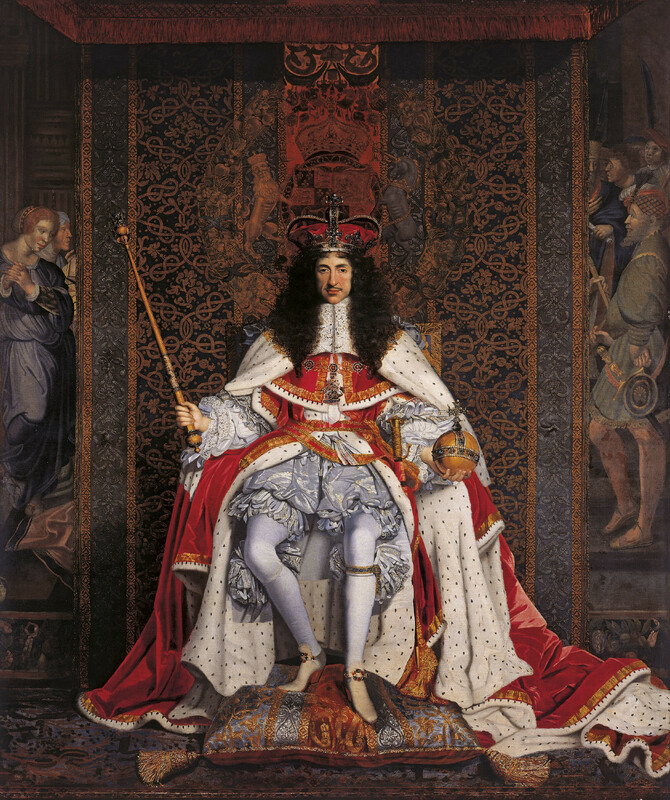 Charles II is dressed in Parliament robes over the Order of the Garter costume, wearing the Crown of State, the Sword of State and the Garter Collar with the Great George, and holding the new Orb and Sceptre made for his coronation. The king is shown seated under a canopy of state embroidered with the royal arms, in front of an armorial cloth of honour, with a tapestry depicting the Abduction of Romulus and Remus partially visible behind. The formal, hierarchical pose, the type more commonly found on seals and coins, together with the symmetrical design and meticulous detail, recalls depictions of earlier English monarchs such as Henry VIII (1491–1547) and Elizabeth I, and suggests the continuity of the royal line. The model for the composition may have been the central section of The Family of Henry VIII (British School, sixteenth century; RCIN 405796), painted for the Tudor king and hanging in the King's Privy Gallery at Whitehall in 1666. The artist John Michael Wright, the son of a London tailor with Scottish connections, was apprenticed at the age of 19 to the portrait painter George Jamesone (1589/90–1644) in Edinburgh. He then spent ten years in Rome, where he may have converted to Catholicism, and on his return to London in 1656 he established a reputation as an artist. Although Wright received limited royal patronage after the Restoration, including a commission for a large ceiling canvas for Whitehall Palace, he was not granted a royal appointment until 1673. It is not known for what occasion this portrait was painted or where it was originally displayed, and there is no evidence to suggest that it was a royal commission. Although traditionally thought to have been painted soon after Charles II's Coronation on 23rd April 1661, various elements suggest that it might date from the 1670s. The wig for example, is of the full bottomed type popular in that decade and the jewelled buckles depicted on the monarch's shoes are characteristic of the Persian' style, fashionable at court in 1666. Moreover Wright mentions in a letter dated 27 July 1676, 'I am told the King will sitt to my great picture for the Citty this next moneth' (although the painting to which this refers is not clear). The sitter's face also appears to be that of a man older than thirty-one. The design was probably finalised by 1673, before the publication of Edward Chamberlayne's Angliae Notitia, or The Present State of England, where the frontispiece by William Faithorne (1616–91) illustrates a similar design. It is likely that the commission came from the wealthy and successful banker and royal goldsmith, Robert Vyner, who moved in royal circles and became Lord Mayor in 1674. Vyner had supplied the regalia for the coronation in 1661, represented here in great detail and also depicted in a still life attributed to Wright, thought to have belonged to Vyner (Museum of London). Vyner also chose Wright in 1673 to paint a magnificent portrait of himself and his family at his estate of Swakeleys, Middlesex (National Portrait Gallery). A derivation of this portrait may have been sent to Rome in 1686, when Wright, as Chief Steward in charge of artistic presentation, accompanied the Earl of Castlemaine on his embassy to the Pope. Wright, commenting on a banquet given for the prelates of Rome at the Palazzo Doria Pamphilj, described 'a Cloth of State, Embroider'd with Gold, under which, was the King's Picture, as big as the Life, sitting Crown'd on his Throne, and clad, in his Regal Habit'. There is a smaller, possibly contemporary copy of this portrait (Earl of Wemyss and March Trust). Purchased by Queen Victoria from Henry Graves & Co., 1889.